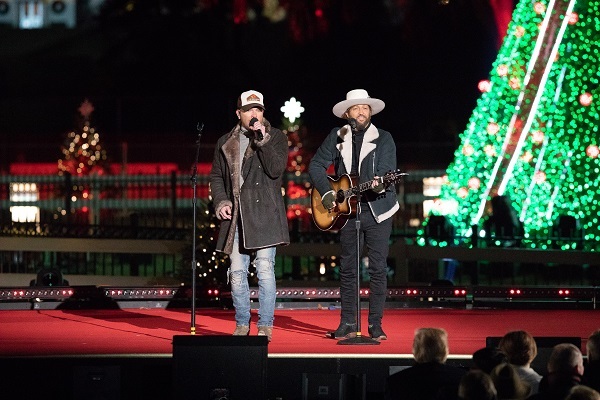 Critically acclaimed Wheelhouse Records’ duo LOCASH helped the country ring in the holidays with two performances on the 96th annual National Christmas Tree Lighting on REELZ and Ovation Sunday night. LOCASH’s own Preston Brust and Chris Lucas performed “Santa Claus is Coming to Town” and teamed up with Mathew West for a rendition of “Run Rudolph Run” during the ceremony. Fresh off signing with BBR Music Group’s Wheelhouse Records, this fall, LOCASH released its brand-new single “Feels Like a Party,” to become the No. 1 Most Added song in the format in its debut. Additionally, this football season LOCASH has teamed up with the mega-brand, Pepsi on its inaugural Pepsi Tailgate Tour where the duo is performing live in conjunction with some of the biggest college and NFL matchups across the country. The guys are also expected to release new music in 2019.